I'm such a fan of bananas. They're great right out of the peel, but there's something incredible that happens when you cook a banana. Heat transforms this sleek yellow snack into a decadent, dessert-worthy thing of beauty. Add some chocolate in there and you're really starting to blow my mind. 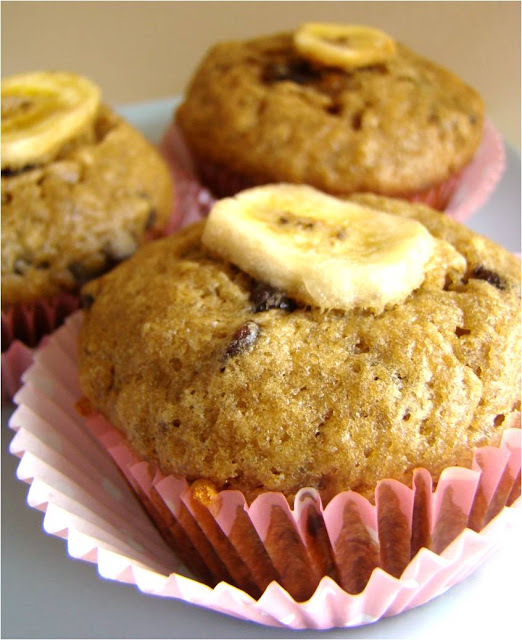 There's so much flavour in these muffins, eating one is like being slapped in the mouth with a banana - a very fabulous banana in a very pretty skirt. While the oven preheated to 350 degrees (F), I combined the flour, baking soda, and salt in a large mixing bowl and set it aside. In a medium mixing bowl, I creamed the butter and the brown sugar. Then I added the eggs, mashed banana, and vanilla (these eggs came from my sister-in-law's chickens, and they must be happy chickens because they make delicious eggs). The wet ingredients were then added to the dry ingredients and stirred just until blended. The chocolate chips were stirred into the batter last. Then I spooned the batter into the liners in the muffin pan, filling to about a 1/4 inch from the top of the liner. 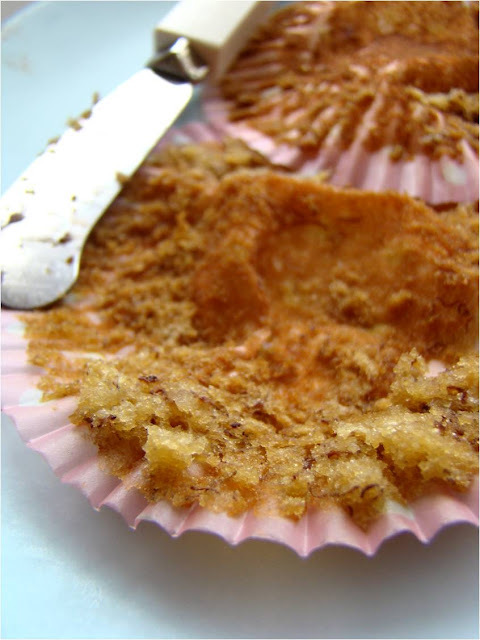 Each muffin was topped with a banana chip, and they were baked in the oven until a toothpick came out clean and the edges were beginning to brown (25-30 minutes). I let them cool in the pan on a wire rack for 10 minutes, then I removed them from the pan to let them continue to cool on a wire rack. You gotta eat one when it's still warm, though! Mmmmm! Chocolatey banana goodness! 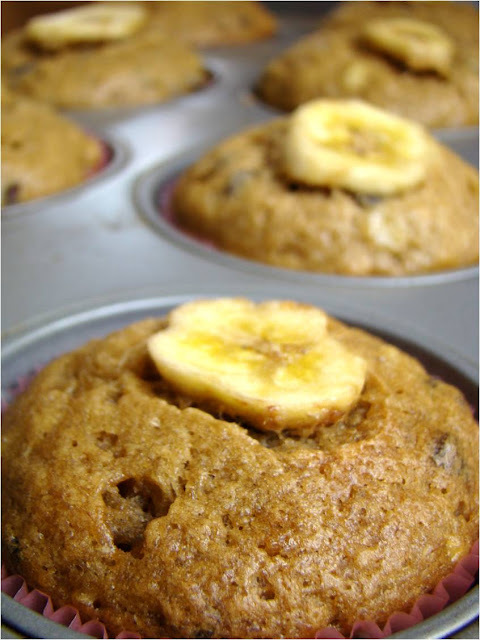 A good muffin is worth sharing, and these would be great for school bake sales, picnics, and play date snacks. But save one for yourself to enjoy with a cup of tea after the kids go to bed! What's your favourite muffin? Do your kids take muffins in their school lunches? Isn't a muffin really just a cupcake without icing? Leave a comment, Muffin, and let's chat! These are some mighty pretty muffins. One of our fave combos as well. The eggs are just stunning, lucky you to have them fresh from the source. Are they urban chickens or full blown farm hens? 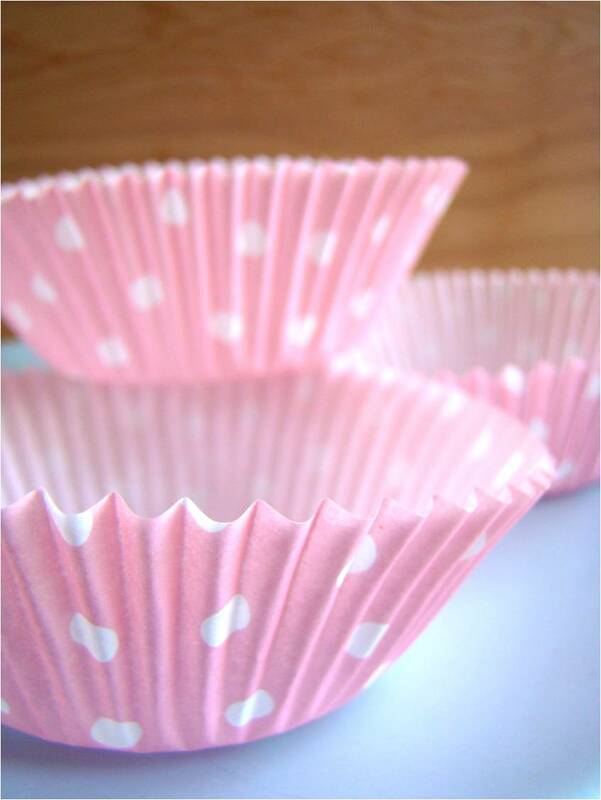 Well, you know we love muffins :) C actually calls them cupcakes, no matter what sneaky healthy stuff gets put inside! I love the banana slices on top of the muffins, so pretty. May I suggest that with so much sweetness from ripe bananas and chocolate chips you could experiment with cutting down on quantity of sugar? And yes, they're very pretty looking muffins. Thanks for sharing. Not a scone fan but these look delicious. And I'm totally stealing tea syrup. I have a beautiful blueberry tea in my cupboard that would make a wonderful muffin, I'm sure. made these this morning for my little ones. they loved them! thanks for the recipe!